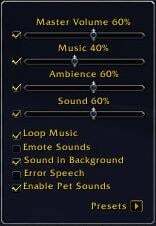 Toggles for "Sound in Background", "Sound at Character", "Loop Music", "Error Speech", "Pet Sounds", and "Emote Sounds". Presets accessible via "/vol <preset name>"
The control panel can be accessed via the "/volumizer" or "/vol" commands, as well as a LibDataBroker launcher. - Fixed erroneous table assignments for new users which resulted in all presets sharing a single table. - Added command-line support for preset switching; /vol <preset name> - non-case-sensitive. - Removed hard limit of five presets - they can now be added and deleted at will. - Added mouse-wheel support to the LDB icon for master volume control. - Clicking a preset will now hide the preset menu. - Volume sliders now operate on a 5% basis, down from 10%. * Fixed error when clicking Accept instead of pressing Enter when renaming a preset. * When renaming a preset, the Accept button will now be disabled until a name is entered. * Fixed issue with renaming/saving presets. * Adjusted anchoring of presets menu. * Removed "Use" option from second-level menu - presets are now used by clicking their name from the first level. * Removed showing of the control panel when mousing over the LDB icon - it will now be shown when using the right mouse button. * Added support for "Sound at Character" toggling. * Added mousewheel-awareness to the individual sliders. * The control panel will now automatically show when mousing over the LDB icon. * Clicking the LDB icon will now mute/unmute all sound. * The panel, when opened via the slash command, can now be dragged. Position is not saved between open/close. I basically did it for the hell of it. * Added a tooltip-style view when used in conjunction with an LDB display AddOn - The Blizzard-style view will now only show when using the slashcmds "/vol" or "/volumizer". * Added a toggle for "Pet Sounds". * Changed the tooltip for the LDB plugin to use a localized string rather than English only. * Changed LDB dataobject's type to "data source" from "launcher" since it does indeed display data. * Changed the title box to be more in line with the default Blizzard UI. * Fixed a bug where naming a preset "Default" would make it disappear from the list. * Updated TOC for WoW 3.1. * Revamped panel look-n-feel to more closely resemble the default UI. * Added the ability to define and name five different volume presets. * Changed LDB icon behavior to reflect whether or not the master volume was toggled. * The control panel will no longer close when the mouse pointer leaves it. * Pressing the "ESC" key, clicking on the WorldFrame, clicking on the LDB icon, or using the SlashCmd while the panel is open will close it. * Added tooltips for all checkboxes. * Added text field to LDB object to display the current Master volume level. * Added current volume levels next to the slider names in the control panel - made the label font smaller to fit this in. * Added "/vol" slash command to bring up the control panel. * Minor bugfix and load-time optimizations. * Added check-box toggles for "Sound in Background", "Loop Music", "Error Speech", and "Emote Sounds". * Added "/volumizer" SlashCmd - opens the control panel in the center of the screen. * Removed AddonLoader support. This was causing issues with ButtonBin and NinjaPanel, and possibly other display addons. Strangely, though, it worked fine with DockingStation. * Added toggle check-boxes for each sound type. * Removed min/max volume labels, as they were unnecessary. Any chance there can be a slider for Dialog added? Thanks! Not sure what this needs, other than a TOC bump. Adding the Dialog button, perhaps. I've tried adding presets but Apparently I'm doing something wrong, because changes I make don't get propagated, it seems, from session to session. I've been assuming it was because my game was crashing when I swapped to other toons (which Blizz has been trying to fix, apparently). I don't know if the author has any plan to update this, but in case you do would it be possible for you to make Volumizer work with ElvUI? Impossible. They only support data feeds and completely ignore launchers. Both have been in the spec since 2008, and I'm not breaking my AddOn for everyone who isn't using ElvUI. 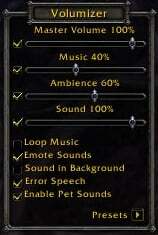 The addon is missing Dialogues volume bar that is present in WoW sound options. Also adding option to toggle Headphone mode would be awesome I keep switching from speakers to headphones in the evenings and night and have to go through menu and options to adjust it for better audio experience. Last edited by natassja72 : 03-03-15 at 10:11 AM. This addon is causing far too many errors, always during combat and always the errors are about Volumizer trying to call a protected function! Almost 2 YEARS have gone past since then and apparently nothing's been done to fix it, does that mean it's just never going to be fixed? Is Volumizer really at fault here or is there something else at fault? I'm also wondering if Torhal is still working on this? Hey, now - watch the entitlement! Seriously, though - there hasn't been anything really to be done with the code save for minor stylistic changes to what I do now as opposed to my style five years ago. The protected function stuff is Blizzard's taint system going haywire. I'm not touching anything to do with CompactRaidFrames or anything else that's combat sensitive. What I am doing is using the default UI's DropDownMenu system which randomly taints the default UI code - something Blizzard has been needing to fix for years and which got really bad around Cataclysm and even worse with MoP. At any rate, I've updated the AddOn for the 5.3 patch. Firstly, apologies for the "entitlement", that certainly wasn't my intent. Thank you for confirming my suspicions, that it's not actually the addon itself that is causing the errors but simply a fault of Blizzard's taint system itself. It's a shame that Volumizer gets the blame but I guess Blizzard don't want their system to be blaming itself so they prefer to put the blame on other addons! I suppose we just have to live with this for now, at least until (or even if) Blizzard decide to actually fix their own coding. Last edited by Grizzly UK : 06-13-13 at 08:15 PM. Unfortunately Blizzard has made the UIDropDown frames more prevalent in areas of code that are secured or protected, so AddOn taint is more of an issue. I'll look at mitigating some of this and, failing that, look for a different DropDown solution for presets. Last edited by Grizzly UK : 06-10-13 at 12:18 PM. Just wanted to report the following bug I've been getting. Mostly it seems to occur while in combat, but it happen at other times as well. It's interesting because when it does happen, I'm not messing with Volumizer at all. It's been going of a bit, but I keep forgetting to report it. Thanks. Message: Note: AddOn Volumizer attempted to call a protected function (CompactRaidFrame1:SetAttribute()) during combat lockdown. Any way to make Volumizer to work with ElvUI datatext? It works with any LDB display, which should also work with ElvUI/TukUI. Alternately, you could just type /vol to show the frame in the center of the screen. Last edited by Torhal : 12-18-12 at 03:43 PM. I stumbled upon this addon while looking for one to adjust the volumes in and out of combat automatically, say normal music and ambience volume while not in combat, but muted during combat. Would this be a feature you would like to implement? this error comes in fights with massive npc, players in sights - like battlegrounds or 25 man raids. I don't know if it is a Volumizer Error, what has Volumizer to do with compactUnitFrame.lua? 4x <event>ADDON_ACTION_BLOCKED:AddOn 'Volumizer' hat versucht die geschützte Funktion 'CompactRaidFrame1:Show()' aufzurufen. Hehe, this has been requested a few times - I'll get to it hopefully soon. I've added this as of version 2.0, along with other things.